Well, I almost didn’t write a new post today…no news is usually good news, but I suppose being the author of a bloggity…no news is bad views? 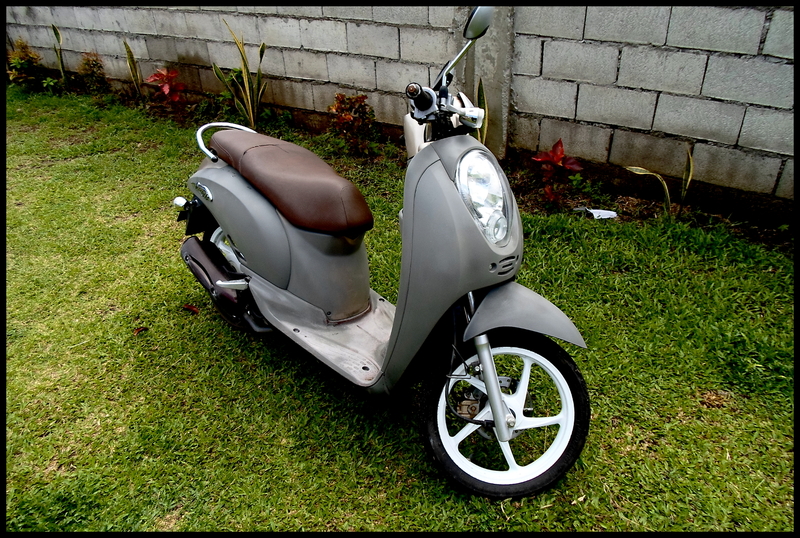 So I suppose I shall talk today about driving on the Scoopy. Way back in the day, when I was a little youngster, I thought it would be awesome to get my driver’s license… a personal milestone of life-changing grandeur, opening a whole new world of opportunities and greatness. I couldn’t wait to turn sixteen and buy a cheap rust-bucket to call my own. As sixteen got closer and closer to becoming a reality, I realized that having a car was highly overrated, way too expensive, and much more work than I was willing to put in, and in the end, I never ended up getting my license. When I moved out to the Philippines at first, the roads and traffic terrified me… the people here are insane on the road, and rivaled only by Montreal, in my mind. My husby Damon told me I would get used to it, and that while it looks chaotic and dangerous, there actually is somewhat of a method for driving here. I thought he was just as insane as the rest, especially after telling me that when he’s alone on the bike, he drifts around corners and reaches speeds of over eighty without a helmet… Can you say potential street pizza??? Eventually though, after about four months of my being here, I got the driving itch. One day when there was nothing going on and I was ready to crawl out of my own skin at the boredom I was feeling, I decided to hop on the bike and go for a spin. Previous to this, my only experience with the bike was being on the back with him, and one teensy instance of driving it from the Sari-sari to our house…a grand, majestic total of about a two-minute trip down the driveway. I had never driven a car in my life, let alone a scooter, which is what we own. So the day I drove alone, I went up the mountain… Deciding that since I hadn’t been up that way yet after months of asking Damon to take me, I’d just go right ahead and take my damn self. I have to say, it was a lovely drive, the flowers, trees and various plant life here are all breathtaking, not to mention the scenic views of the city from the mountainside. I could feel the local people all staring at me, and a few tried to get my attention, or said hello as I drove past… but being a foreigner here, it’s getting to be a normal thing for me to experience. I almost drove myself off the road trying to avoid a baby chicken, and at one point I was stopped by a large herd of goats, but other than that, the ride up was smooth and beautiful. I decided at one point to stop and ask for directions, and realized as soon as I did that I was on my own darn street. I got home just before the tank ran dry, and decided I think I may very well fancy this driving stuff… I can’t wait to go out and adventure again…next time, I’ll remember to bring my camera.